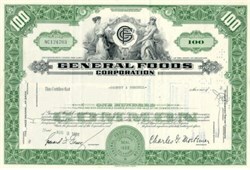 Beautiful engraved Stock Certificate from the famousGeneral Foods Company issued in the 1960's for shares of Capital Stock. 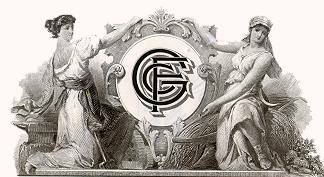 This cancelled certificate has an ornate green border with a vignette of allegorical women on both side of the company logo. This certificate has the printed signatures of the company's chairman and president. This certificate is over 35 years old and looks great framed. The document looks much nicer in person than the scan indicates.